A team of biologists used ancient DNA to finally find this mysterious mammal a home on the evolutionary tree. 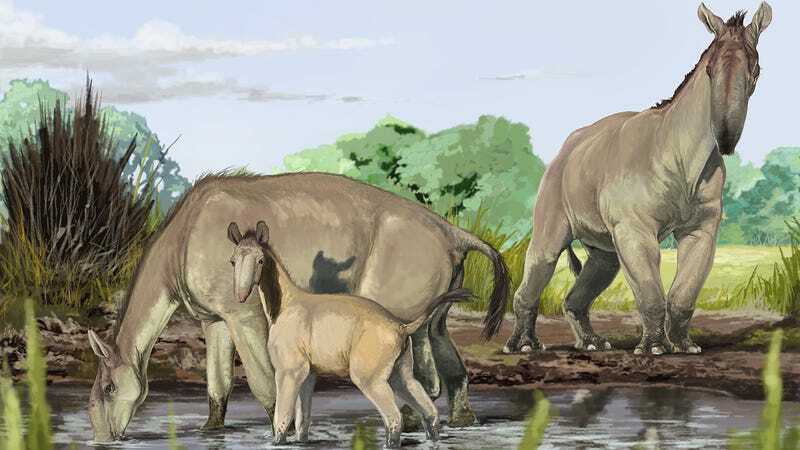 The species, a creature called Macrauchenia patachonica that lived in South America before going extinct around 10,000 years ago, is genetically closest to the order containing the odd-toed ungulates that includes tapirs, rhinos and horses. But finding that relationship wasn’t easy, given the old, short segments of DNA scientists had available. Since then, another team used ancient proteins to understand the animal, but now scientists have actually been able to confirm its evolutionary relationships using DNA evidence. The first challenge was simply finding the animal’s DNA. DNA typically degrades off of bones not trapped under permafrost, like those in warm areas. Biologists gathered M. patachonica fossils from several museums around the world, and were able to find and sequence a modicum of mitochondrial DNA (your cells also have DNA in their mitochondria, as well as in their nuclei) on the bones to compare with existing species. So a big congrats to M. patachonica. You may be extinct, but you finally have a home.